I love all the new technology that allows us to monitor our pace and distance, but there’s a drawback to my beloved NikePlus: When I’m on a timed run, I’m not nearly as inclined to stop and smell the free stuff. A brand-new $25 vase, free, on the run! You know…the free stuff on the side of the road. Call me a Hoarder in Motion, but it’s tough to keep going when something glistens on the side of the road. Remember Templeton, the rat from Charlotte’s Web, always foraging for a bit of string or a half-eaten lunch? I’m not that bad. Not yet. But I will interrupt a personal best if there is a brand-new vase from Pier One, $25 price tag still attached, half-hidden in the weeds, calling to me. If these guys can do it, we can too! Image via Wikipedia. Our running selves are made up of lots of things: our level of ambition; the amount of time we’re willing to commit to the sport; our life circumstances; our athletic history; our DNA; and even our finances determine who we are as runners. With all these variables defining us, it’s no wonder we’re all so different and that there is about 5 hours between the winner and the last person to cross the finish line in most marathons. In this light, our differences seem like no big deal. We’re all runners, right? But the reality is not so Kumbaya. Speedism divides us. Perhaps our most famous (or infamous?) prelaunch post, this rerun is inspired by the Paul Ryans and the Kip Littons of the world. It would have been much easier for them to just run a short race course and saved themselves a lot of trouble! This post discusses how one can determine if a race course is legit – the distance the t-shirt says it is – and also discusses whether or not it’s ethical to use a race time from a course you suspect is short as your PR. This post was originally published on March 13, 2012. In the last installment of this great debate, Ginger clarified and defended her position. When it was all boiled down we really didn’t disagree all that much, but Ginger and I and all the Salties really enjoyed this thought provoking conversation as we hope you did today! Don’t forget to weigh in with your take! This post was originally published on April 18, 2012. I probably shouldn’t be arguing with a lawyer! In fact, I’m not going to, for multiple reasons. However, I would like to respond to the recent buzz that was generated here at Salty Running. I knew my post would create such buzz, as I presented a pretty popular debate. However, I didn’t think it would be in such a way that made me out to be a bad guy. I’ve never been the bad guy so this is all new territory! While I completely respected Ginger for being honest and open to debating such a controversial issue as what constitutes a “legit” marathon, I just had to stand up for those like my friend, Tim, who have overcome so much to finally cross a marathon finish line, no matter the time. This post was originally published on April 18, 2012. When Salty Bloggers disagree we post about it and then head to the mud pit out back. (This was the last guy who tried to blog for us.) Image via Wikipedia. On Monday Ginger posted her controversial opinion that some marathon finishers should not claim to have run the marathon because they walked too much or ran too slow, herself included. I love Ginger, but this time I disagree with her. Heck, I walked in 3 of my 5 marathons. And while I nit-pick my performances I would never deny myself from feeling the satisfaction of the finish. Today we’re re-running a debate we had back in April. Ginger wrote about the time she ran a marathon completely unprepared and contemplated what it means to say you “ran a marathon.” Is there really a difference between those who’ve run 100+ mile weeks and those who’ve run 25 or less in prep for their big day? Is there a difference between racing and “just” finishing a marathon? Is the difference a matter of finishing time? Amount of preparation? Attitude? Are you an elitist jerk just for contemplating this issue? A little later I’ll post my own rebuttal to Ginger and then after that Ginger’s rebuttal to my rebuttal. It was the first time we Salties disagreed, but it most certainly wasn’t the last! This post was originally published on April 16, 2012. I look like I’m running, but I don’t remember. The original race bandit? Image via blogs.citypages.com. The bib-less bandits run among us. They gum up aid stations, photobomb our race photos and steal our bananas at the finish line. But they also make history. Today I’m writing about bandits: people who run races without paying to enter them. While researching the net for this post, I’ve become more apprehensive to reveal that I’ve…*ahem*… “jumped into” a few races without paying the often overpriced entry fee. But does it help to say that I would never bandit my “A” race of the season? If I also thought I might be in for a big PR mid-way through training, I will gladly pay the fee to compete, too. Other than these two scenarios, is there really any harm in heading out for a run that just so happens to be with 5,000 or so other people on a perfectly marked course, fit with timers and water stops? Jenn Shelton’s competitor better be revering her! Okay, so I do wear pink when I run sometimes. And just to be clear, I don’t hate it. Like every color of the rainbow it has its place in the world. Beautiful roses are pink. My mom’s lipstick is pink. But the only pink I wear for running tends to be my fabulous Betsey Johnson sunglasses that have pink leopard print on the sides. In fact, I liked those sunglasses so much that when I saw them in green a week later I snapped them up and now wear those far more often. See, pink leopard print is just funny to me. It’s over-the-top, which is more my style than any color of the rainbow. Green, on the other hand, is the color I like to wear the best. As a redhead it contrasts nicely with my hair, and it compliments my skin tone really well. And wearing green instead of pink feels less like I’m buying into an ideal of femininity that doesn’t suit me. Social Media and the Runner: How Much Is Too Much? I’ve had my fair share of running blogs. And non-running blogs. I’ll pour my heart (and training) out to the world for a few months and then get this scary feeling inside that tempts me to want to hit the “delete blog” button as well as deactivate my Facebook account, slipping back under the radar. And my bedroom comforter. What if Trayvon Was a Runner? 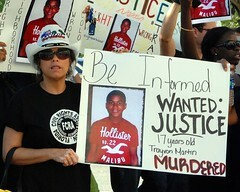 I’m a mom to a son and my heart bleeds for Sybrina Fulton, Trayvon Martin’s mom. Trayvon Martin was the young black teenager who was talking to his girlfriend on his cell phone as he walked back to his father’s fiancee’s house. Trayvon was returning from the store where he bought candy in a mostly white neighborhood. He was senselessly shot by a man who claimed Trayvon looked “suspicious.” He was a boy with a girlfriend holding a bag of skittles, but apparently since he was a black boy we have to mention he was unarmed. Ugh. But anyway, I cannot fathom how awful it would be to lose your child in such a senseless and horrific manner. I’m not sure why, but I was sitting here sipping my afternoon coffee when I pictured young Trayvon innocently walking on the sidewalk. Then I wondered how it would have been different if he was a runner? Would he have appeared even more “suspicious”? If a young black man can’t walk down the street with a bag of skittles and a cell phone, I imagine the George Zimmermans of the world wouldn’t look too kindly on a young black man running through his neighborhood. Does a young black man who wants to be a runner need a sign that says, “I didn’t steal anything I’m just a runner?” Or does the fear of looking suspicious simply deter young black men from the sport all together? I don’t know the answers, but the thought of even one person being afraid to enjoy the sport I love because of people like George Zimmerman makes my blood boil.